Today I looked round my desk and was faced with a sight that is all too common in modern Britain. The grim truth is that we all take too many sachets of sauce from the cafe or canteen, we just do. Whether its some sort of instinctive nesting impulse or just the fact that we can get something for free so we do. The untold story though is what happens to all of these unwanted sauces once they are taken from the relative comfort of the canteen stainless steel container. Do they ever make their way home? No, for once they have been removed they somehow become dirty. Nobody has opened them, nobody has licked them, but they can never go back, they are alone. 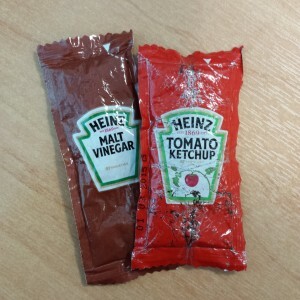 Destined to see out their expiry dates in the back of an office drawer, or become a ticking time bomb in the pocket of someone who never checks their pockets before doing the washing. Spare a thought for the unloved sauces. Reuben does the same thing but with packets from Costa Coffee. This evening his mum found a delightful selection of sugar and giant rocks in his pocket. One of our shared desks at work had fifteen sauces on it. I binned them all and got told off. I don’t understand that. Ironically the tomato sauce in your picture IS dirty and I certainly wouldn’t want it. Who scolds someone else for binning sauces? My mum used to keep tiny packets in the fridge but then she’d forget when the sell by date was and they would remain there, frozen in time, with nobody sure whether to use them or not. We all have our sauce stories. Do you get packets of giant rocks in Costa Coffee now? It’s the latest thing. Stone-ground coffee. Costa as you all well known offer an array of services for the common human being, including tiny sachets of sugar, sweetener and, yes, giant rocks with which to sour up your hot beverage or throw them at celebrity chuggers. Or hide them in your trousers. I do not all well known, as well you know, and I’ll thank you not to insinuate that I do. You see you, right, you need to know all otherwise you never will. How could you cope knowing that you don’t know all? If you knew all, like me, you’d get ahead in life. That luxury yacht could be yours. Whose is it at the moment? I leant it out to Lennox Lewis for the weekend. Lennox Lewis? You know he always leaves leftover Pot Noodles all over the seats! How could you be so frivalous? He promised He’d behave this time, and besides he gave me a weekend at his mansion in trade.